Over the last five years, the United States has become infamous for our drone assassination program. US drones in Pakistan, Iraq, Afghanistan, Yemen, Syria and Somalia have killed at least 2400 people (and this is almost certainly a dramatic underestimate, as strikes often leave little to identify), many of whom have been confirmed to be civilians. 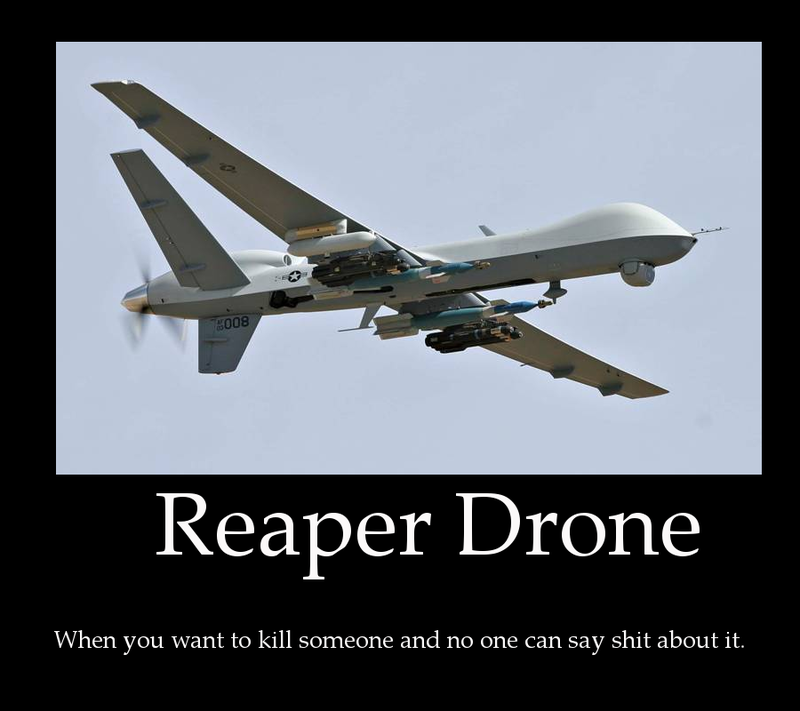 Armed American drones—aptly referred to as reaper drones—are quick, quiet, and capable of circling unseen for hours until they are ready to launch hellfire missiles at their target. They are controlled from thousands of miles away, thus insulate their pilots from risk, and represent a fully detached method of waging war against an enemy with no way of fighting back. The US drone program is justified by the government through citing the “war on terror” and the argument that US drones are a far more effective and less risky manner of killing terrorists than sending in ground troops. Unfortunately, these arguments are both wrong. 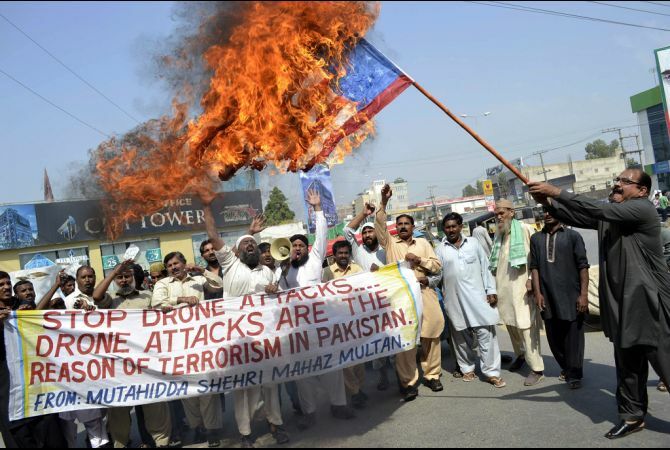 Most of the “terrorists” killed in drone strikes are either civilians or local militants who have no desire to strike on US soil and striking them at home only serves to enflame their hatred. Similarly, drone strikes may kill some terrorists, but they breed an environment of fear in their areas of operation (people live in the shadow of not knowing whether a drone is about to blow up their family) and end up creating more terrorists than they eliminate. While the drone war is primarily an issue of international politics and law, the use of drones by the Obama administration to assassinate American citizens without due process or trial creates a truly terrifying precedent in domestic law-our government is now claiming the power to kill us, without ever convicting us of a crime or giving us access to our constitutional rights. Since 2009, the US drone program has targeted and assassinated four American citizens who it claimed were associated with terrorism. The four Americans assassinated with the US drone program have been Anwar al-Awlaki (a propagandist for Al Qaida), Abdulrahman al-Awlaki (the 16 year old son of Anwar), Samir Khan (the founder of a jihadist publication), and Jude Mohammad (thought to have visited a terrorist training camp). None of these Americans were tried or convicted of a crime before being killed and the evidence against them is largely kept classified by the government. In addition to the four who have already been killed, it has been confirmed that several other Americans have been marked for death, but their identities have been kept secret. These killings are justified by the government through secret memos, using secret legal justifications. Put simply, there has been virtually no transparency in this program, and the US government has killed virtually unchecked by the judicial or legislative branches. Fortunately, a combination of pressure from a few motivated media operations (ex. 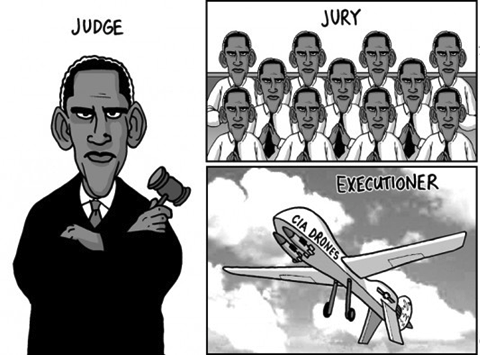 the Guardian) and legal challenges by civil rights groups, has forced the Obama administration to start lifting back the curtain on the legal proceedings that come before an extrajudicial drone killing. Today, (June 23rd), the Obama administration was forced by the 2nd Court of Appeals to release a redacted memo that gives an explanation of their legal justification for assassinating Americans without giving them a trial. This memo dates back to 2011 and deals specifically with the administration’s reasoning for killing Anwar al-Awlaki, but is relevant to the ongoing use of this reasoning to justify assassinations of Americans. While redactions of the memo leave several unknowns, the legal justification that the Obama administration is using to back up these assassinations boils down to an expansion of the justified use of force to prevent harm to an innocent party—in effect, they are treating the assassination of Americans accused of assisting terrorists as the legal equivalent to a police officer shooting a suspect who is holding a gun to the head of a hostage. When a threat is imminent, it can set up an exigency that allows government agents to act without court approval (ex. the police don’t need an arrest warrant to shoot a hostage-taker) and the US government is trying to expand this to cover the assassination of Americans suspected of terrorism. The memo argues that Awlaki’s assistance of Al Qaida—a non-state actor that the USA is currently at war with—represented “a continued and imminent threat of violence or death” against Americans, which allows the government to act without having to go through the courts. Because these Americans were located in areas that the US is not friendly with and where extradition would have been impossible, making it “infeasible” to extract him, the administration claims that they can simply launch a missile at the suspect. According to the reasoning in this memo, Awlaki’s alleged “continual planning and direction of attacks against US persons” fulfills the definition of “imminent,” even when we don’t have information about a specific attack or when it might occur. They claim that the immanency is attached to the possibility that Awlaki might be planning an attack at any moment, thus claim that he is always an immediate threat. Throughout the memo, there is a general assumption that the executive branch and intelligence community should be the ones to decide who is connected to terrorism and who is an imminent threat. It doesn’t require that evidence be aired in court or even presented to an impartial party to see if it is sufficient for determining who is a threat. According to this logic, the 4th Amendment is de-facto nullified for any American who is accused of terrorism by a secret group of highly placed and unelected bureaucrats. They can be killed at will and there will never be disclosure of who made the decision or why. In short, this memo says that high level intelligence/executive officials can mark an American citizen for death through an internal determination that an they are a member of a terrorist group which might be planning an attack against the US in the future and that it isn’t feasible to capture them—at no point will the government need to prove that a plot actually existed, present evidence that the person was actually involved in planning attacks (maybe they are innocent or just made anti-American propaganda), or even explain why they thought that it was impossible to capture the person. The justifications contained within this memo are constitutionally offensive and the American people need to push our officials to reform the drone program. 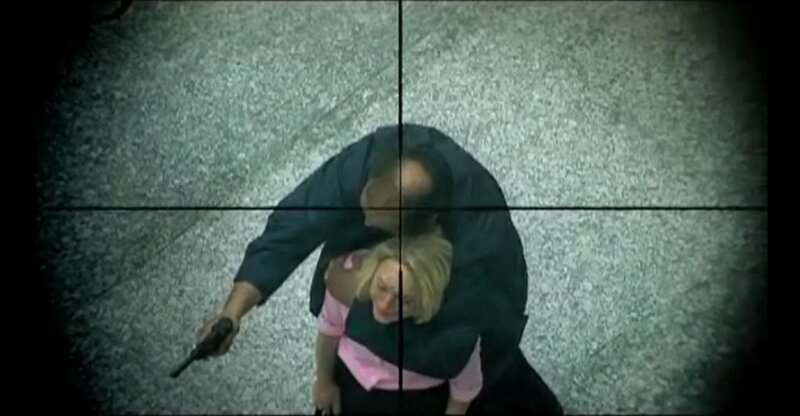 It is certainly possible that some circumstances could allow the government to kill an American terrorist without a trial, but this would only occur when the threat is truly imminent (ex. destroying a car bomber while he is driving towards his target) and when there is real evidence that a lethal action is required—additionally, once the person is killed, there should be immense scrutiny on the killing and complete transparency about the process that led up to it. This is a re-blog. 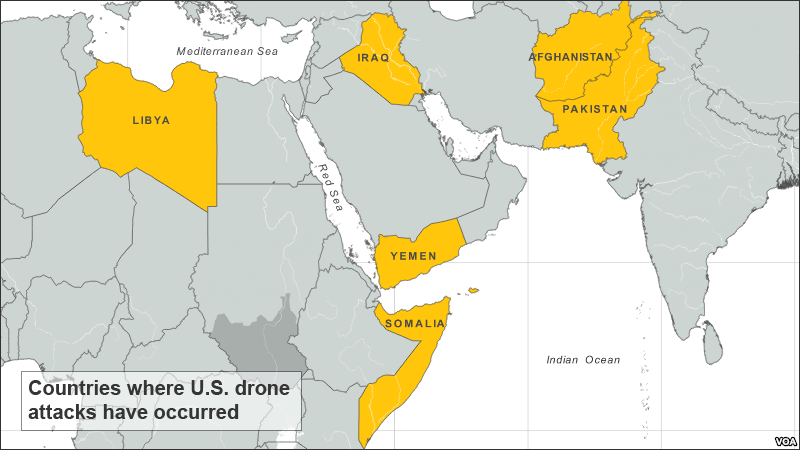 According to this, the U.S. has conducted drone strikes in Libya, Iraq, Afghanistan, Pakistan, Yemen, and Somalia.